The High-Speed HDMI with Ethernet Cable Kit from Pearstone provides you with two 15' high-performance HDMI cables for all your home entertainment needs. These cables support advanced capabilities like Audio Return Channel, 3D content, support for 4K resolution and an HDMI Ethernet channel. 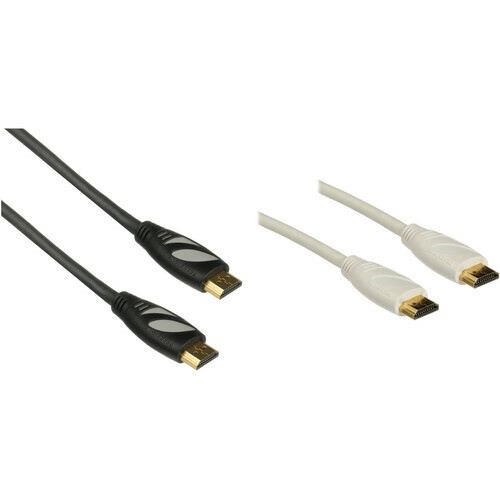 The cables offer an ideal interconnect for equipment like HDTVs, DVD/Blu-ray players and cable and satellite boxes. The High-Speed HDMI Cable with Ethernet from Pearstone is a high-performance cable ideal for HDTV, DVD/Blu-ray players, and cable and satellite boxes. This cable supports ultra-fast speeds, Audio Return Channel, 3D content, and UHD 4K (2160p) resolution. HDMI Ethernet Channel consolidates video, audio, and data streams into a single HDMI cable. Box Dimensions (LxWxH) 7.1 x 6.0 x 2.5"